Venezuela's Chávez Says He's 'Fine' After Surgery : The Two-Way The Venezuelan president was in Cuba for surgery of what is suspected to be a recurrence of cancer. A huge photograph of Venezuelan President Hugo Chavez is displayed on the facade of state-owned oil company PDVSA (Petroleos de Venezuela) in Caracas on Wednesday. The text reads, "Move forward, commander." After undergoing surgery for a lesion on his pelvis, Venezuelan President Hugo Chávez made his first public comments on Thursday. "I am fine, my recovery is accelerating," he said via phone to Venezuelan state TV, according the AP. "A greeting, a hug to you all!" Chávez went to Cuba for surgery because the lesion was in the same area where he had cancer surgery last year. Last month, Chavez said the lesion was less than inch in diameter and "very clearly visible." This is a very pivotal moment for Chavez. Last time he was in Cuba for surgery, many in his country questioned his health and the opposition called for him to hand over control of the country. 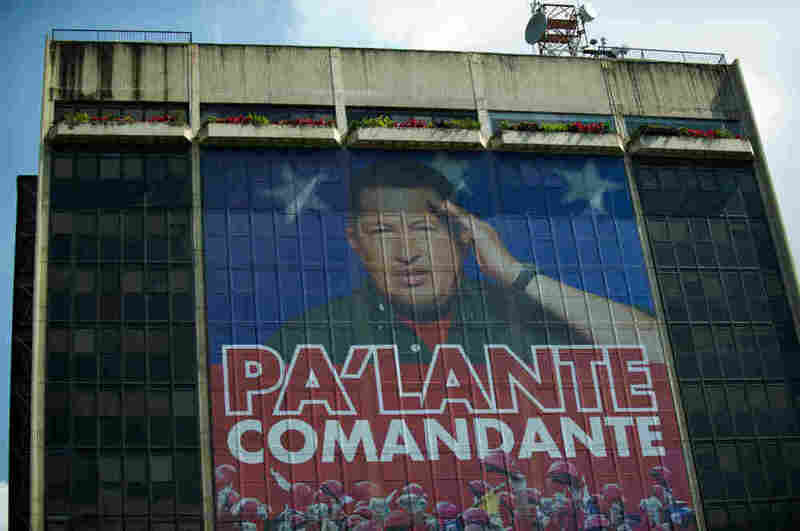 Chávez is also facing presidential elections in October. As the AP put it in a story this week, the surgery gives his rival an opening. Capriles "represents a contrasting young and energetic option," said Diego Moya-Ocampos, an analyst with the London-based consulting firm IHS Global Insight. The 39-year-old state governor has also, perhaps inadvertently, blunted some of the sympathy vote that might go to Chavez by shunning direct attacks on the president. He has cast himself as a polite, non-confrontational politician, a sharp contrast to the venom-tongued president, who recently referred to Capriles as "a pig" and has accused rivals of wanting him dead. But Capriles didn't rise to the bait. "I wish the head of state a long life," Capriles said. "I want him to see the changes that are going to come about in our country, for him to see a Venezuela of progress, a united country, a country where Venezuelans have many opportunities." He added a little dart though: "It's important that people who have an illness tone down the confrontation a bit. It's not good for one's health." Also, before this call, Chávez's opposition was implying that the president may be sicker than he lets on. The government reacted swiftly, reports Reuters, saying Venezuelans should not pay attention to rumors. "People should keep trusting in their leaders," Isis Ochoa, minister for social protection, told state TV.